In 2005, after my first year teaching junior high English, Illinois passed a mandate to expand the required Holocaust unit to include other acts of genocide. Like most new teachers, I turned to colleagues for help, but found very few knew much about genocide beyond the Holocaust. So I began seeking genocide literature appropriate for junior high readers. The first book I found was Tree Girl by Ben Mikaelsen about the genocide of nearly 200,000 Maya in Guatemala in the early 1980s. I bought a class set with my own money eager to “meet” the standard and further explore this atrocity alongside students. I approached this reading as I had the Holocaust unit: with a packet of guiding questions, discussions, quizzes, research, and a multiple-choice/short-answer final exam. As we read, students filled out the packet, which I used to assess their reading. I marked wrong answers with a slash; I awarded right answers with a smiley face or a “Good job!” I continued like this until we got to Chapter 5, when the main character witnessed a massacre. We had to talk about whether this incident was true and how Mikaelsen would have access to this truth. We had to ask ourselves the questions: Who is Ben Mikaelsen? Why did he write a novel instead of a biography? Where is the real Tree Girl, and why could she not write her own story? Why make us read about this atrocity? What are we to do with this knowledge? How do we carry Tree Girl’s story in our memory? I was in over my head and incredibly uncomfortable being in this position of ignorance. Clearly, I should have studied more about how to approach genocide literature rather than simply seek out titles. I thought back to all the other books I had taught with this narrow packet-based approach, all the student-written essays I had labeled right or wrong, all the conversations I had dismissed with a swipe of a pen, all the complexities I had reduced to something neat and measurable. I spent the next decade figuring this all out. I even wrote a very expensive book about it. In Chapter 12, “Assessment: No More Numbers and Letters,” I grapple with the irony of using grades to label and categorize students as we read about the dehumanizing mechanisms of genocidal regimes. To teach about genocide means to call attention to (1) the question of how much power a state should have, (2) the responsibility to prioritize human concerns over political and economic ones, and (3) the way that each institution contributes to the development of a nation. Schools contribute to the development of our nation. What do we contribute if we consistently reduce human complexity to neat, quantifiable measures? To know about is one thing, but to confront, to intervene, to act is something quite different. What we do in ELA classrooms is bear witness to lives lived—our students’ lives and those beyond the classroom walls. We have to be literate in how stories represent humanity in all its forms. That takes certain skills, but it also takes a certain stance—one of responsibility. What does one do with this knowledge? Do we just fill in blanks, respond to a question, show mastery? Okay. And then what? We have to keep the conversation going. The identity of the teacher—one who knows, who assigns, who grades—is superfluous in the first encounter. In the learning conversation, the teacher is careful not to coerce the student into saying what the teacher wants. When a student has misunderstood a key component or skill, what do we do? Subtract points, cross out the error, write “awkward” or “do over”? That is easier. That is controlled. That is standardized because it minimizes diversity, marginalizing the students’ individuality and humanity in the process. A live encounter invites transformation—not standardization—of both teacher and student because the outcome is unknown and open to becoming. And isn’t learning about becoming? I don’t teach with packets or worksheets anymore. I have reframed my whole approach to teaching ELA. There is no meeting of mandates or teaching about. Instead, we bear witness to lives lived in all that we read and write. It is a literacy which defies measurement. 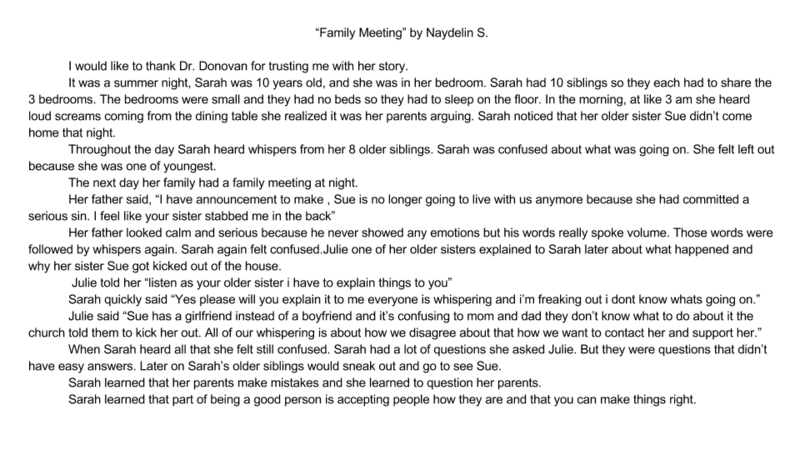 I teach students how to bear witness by engaging in a story exchange where we share narratives from our lives (see Naydelin’s story “Family Meeting” below). 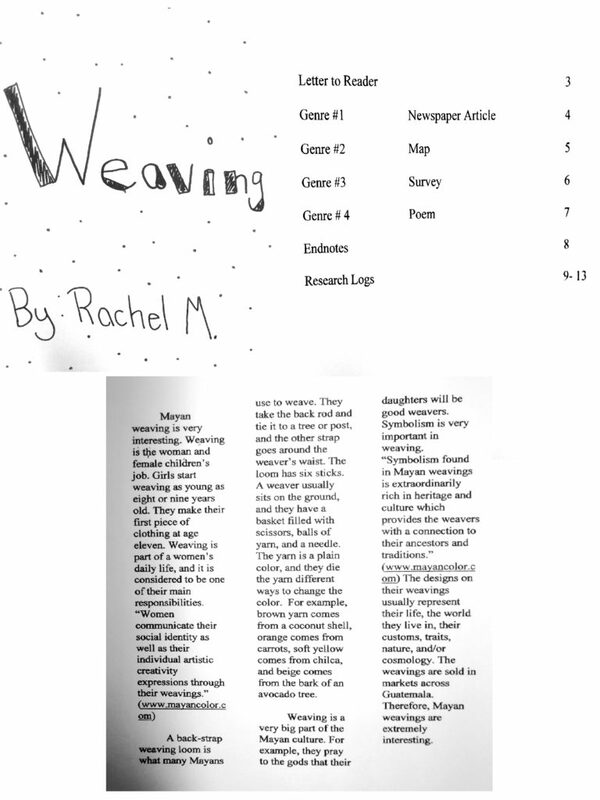 I teach students to look for gaps in narratives through multigenre research projects (see Rachel’s project “Weaving”). I teach students to share their emerging understanding of becoming in the world beyond the classroom (see description from a local youth summit). Sarah J. Donovan, Ph.D. is a junior high ELA teacher in Palatine, Illinois, and an adjunct professor at DePaul University, where she teaches courses in adolescent development. 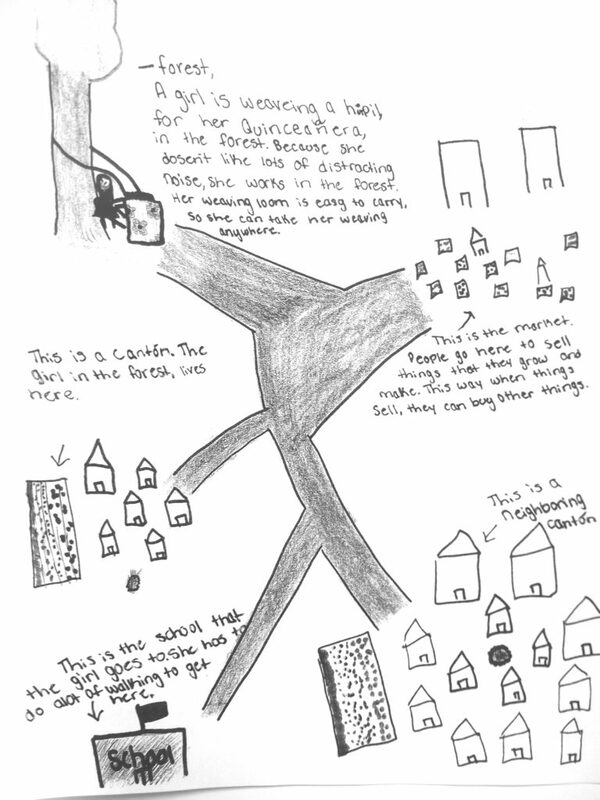 She writes about the struggle and beauty of teaching on Ethical ELA. You can connect with her on Twitter and Facebook. “Isn’t learning about becoming?” I love that. Thank you for that reminder. Thank you, Becky. I use this phrase a lot in my thinking about teaching — as a teacher, I feel like I am always becoming (never a master), and if I think of students the same way, I am more of a temporary partner in their becoming and consider it a privilege. Sarah, you’re touching on a critical connection that I’ve also been trying to make lately, namely, that gradelessness is a humanism. And conversely, that grades are dehumanizing. The irony of grading student responses to genocide places this truth in stark relief. Without overstating the connection, I think you begin to sketch out why grades are not a “victimless crime,” how they can prevent us from bearing witness to one another’s stories in all their beauty, pain, and complexity. Thanks for sharing this important post with us. Thanks for reaching out via Facebook. I am talking to my publisher about publishing that chapter on ethicalela.com. Great article Sarah. I, like Becky, feel that ‘learning as becoming’ resonates with my practice. I especially appreciate that this frames learning as the development of a personal narrative that allows for a meaningful relationship with others/ideas/the world. Relationship suggests a two-way connection that is constantly changing and evolving. This squares with my own sense of the work I do. Thanks for putting it so succinctly. Thank, Mark. I have been using “becoming” to help me understanding my teaching practice. 15 years later, I still say that I am “becoming a teacher”; I am still and will always be learning. Same with students. They are always becoming, so any sort of letter or number next to their name may be seen as temporary, but, for me, it is implies an end. Reframing learning as always becoming implies to all stakeholders that we are complete human beings who are working toward a better understanding of our place in this world alongside others….that will never cease.